Use this toolkit of marketing ideas to help publicize the Vintage Band Festival at your location. 2.) Utilize our press page: http://vintagebandfestival.org/press/ Find the festival’s latest announcements on our News Blog; there’s also a searchable Festival Schedule to gather background information on 30+ bands playing 100+ concerts. We encourage you to share or link to the band bios, in-town and out-of-town maps, audio clips and the promo video, etc. in your blogs and social media. 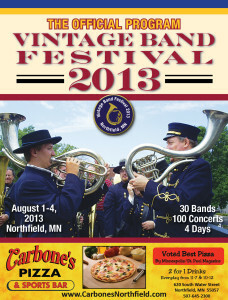 3) Get our gear: http://vintagebandfestival.org/festival/vbf2013-souvenirs/ Call the Northfield Historical Society to order (507) 645-9268. 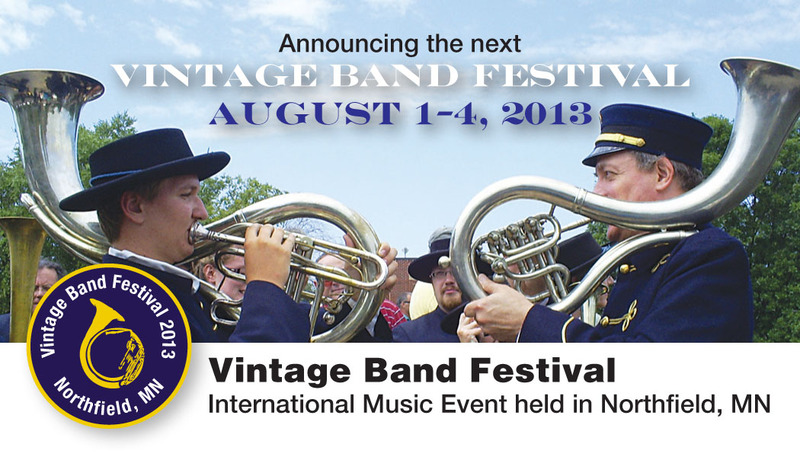 4) “Like” the Vintage Band Festival on Facebook and follow #VBF on Twitter @vintagebandfest for updates. Be social! Contact us at vintagebandfestival@gmail.com and 507-321-1250. 5) You can order quantities of the following printed items by sending an email message with your mailing address to vintagebandfestival@gmail.com. Let us know how many you want. View the Official 2013 Program here.